Yesterday, I was helping out at Durham County Council’s annual halloween event at Hardwick park at Sedgefield. During the day, we put up marquees and tents and signs and temporary fences and all kinds of things like that, and during the event, my job was to be at the end of the grown-ups’ scary walk, making sure that people didn’t enter the exit, basically, and call for counsellors and emergency cpsychiatric help for those who were emotionally damaged by being screamed at and chased by scary ghosts and young ladies with their mouths sewn up. But my camera became bewitched or something and I couldn’t see anything on the screen at all except something that looked vaguely like a bar code. I took a couple of hopeful snaps and downloaded them successfully and present them here for your edification and delight. One shows a ranger up a tree about to hang a witch (not a real one, obviously) and the other is a very nice fairy ring of mushrooms, slightly off-centre as I couldn’t see anything on the screen, see? Unless there are any suggestions about what I can do with this duff camera (nothing physically demanding, please, I’m an old chap…) – it seems I’ll have to buy a new one. Incidentally, this is a big event for the Council and most, if not all of it’s Countryside team is enlisted to help – and they do work pretty hard at this – there is also a big coterie of volunteer countryside rangers, like wot I am who do it for the free curry and because we just like to be helpful. And its a laugh, quite frankly. Anyway – Worriff the marine Bill gets passed and whichever government is responsible for implementing it finds the money and will to implement it? I think that what will happen is that because it will only apply to England and Wales, people are going to start walking along the English – Scottish Border from Longtown(ish) to Berwick on Tweed. Because people will want to link up the Irish Sea at the Solway with the North Sea at the Tweed at Berwick – and thats the obvious way to do it. As it happens, and completely coincidentally, I’m just in the process of planning whatever it is I might do in 2010 - (I do this every year about now…) and an idea occurred to me, following a discussion on www.walkingforum.com that next August, I might do just that – but from Carlisle to Berwick. I haven’t planned the route in detail, but most of it seems fairly obvious – there’s the Kershope Forest followed by the Border ridge which runs to around Wooler – then there’s riverside paths to Berwick. easy-peasy. As the walk will be along the Marches - henceforth, it shall be know as The Marches March. My immediate plans are to be a steward on the scary walk at Durham County Council’s Halloween event at Hardwick Hall at Sedgefield. I’ll be there all day tommorrow helping to set up. We’re expecting 1000+ kids. If the government changed would our access to the countryside change? For a start, there are places where I can not now take superdawg, well, legally anyway. I used to go pretty much anywhere I like with the pooch, but not anymore. The grouse moors of the North Pennines are now out of bounds. A gamekeeper I spoke to on a local estate (a very big one as it happens) wasn’t bothered about me and my dog wandering the ridges – as long as that’s what I did – wander the ridges. But nowadays he really ought to police the place as there’s no dogs allowed and there’s unofficial, but official-looking CLA waymarks next to public rights of way to prove it. And some places are almost permanently closed – one moor is effectively open for access for just the one month, during which they close it to shoot the grouse. Then there’s the wild camping which you’re not supposed to do. Then Nick Herbert, Tory MP for Arundel and South Downs is reported to say that the ban on fox hunting with dogs is a duff law and should be repealed. Then, in Grough – this. The Countryside Land and Business Association don’t like the thought of people having access to the coast. So I send Nick an email and ask him the question. Do the Conservatives intend to alter the current access legislation. I should point out here that Mr Herbert is the Shadow Secretary of State for Environment, Foot and Rural Affairs. He bangs on a lot about preserving and valuing the countryside. Not on your nelly, nor on mine if I had a nelly at all… prolly thinks I’m an activist or something…or maybe he just couldn’t be arsed talking to a townie…. Seems fine. I’m probably just being a bit paranoid. Politicians have that effect on me, for some reason. Incidentally, on his website, Nick says that he was instrumental in setting up the Countryside Movement. This, of course, is now called the Countryside Alliance. This is the first of the Yorkshire Dales Hills walks. A walk very similar to this one appeared in October’s TGO magazine written by Ian Battersby. But I didn’t copy it, I made this up myself…. Anyway, we parked up at Rawthey Bridge and wandered on to Ravenstonedale Common. 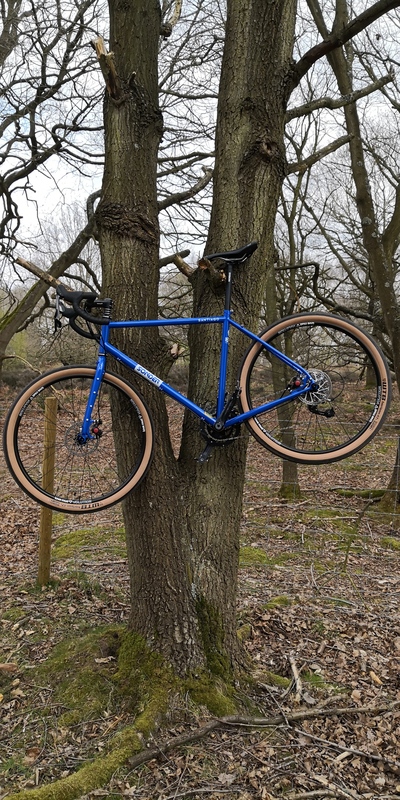 After the shock of suddenly discovering that I knew where I was, I decided, as there wasn’t much else to amuse myself with, apart from plodding uphill over the soaking mosses, to have a bit of navigation practise. 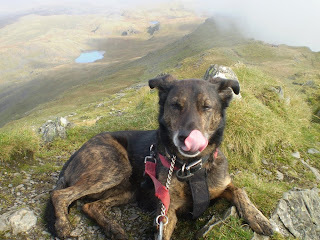 So off I went on short legs and then one really long one designed to bring walker and his trusting dog to Sand Tarn. The surprise was that it worked, despite my assumption that I’d missed it. Sand Tarn is pretty much hidden from below and lies on a little shelf just below the trig point. 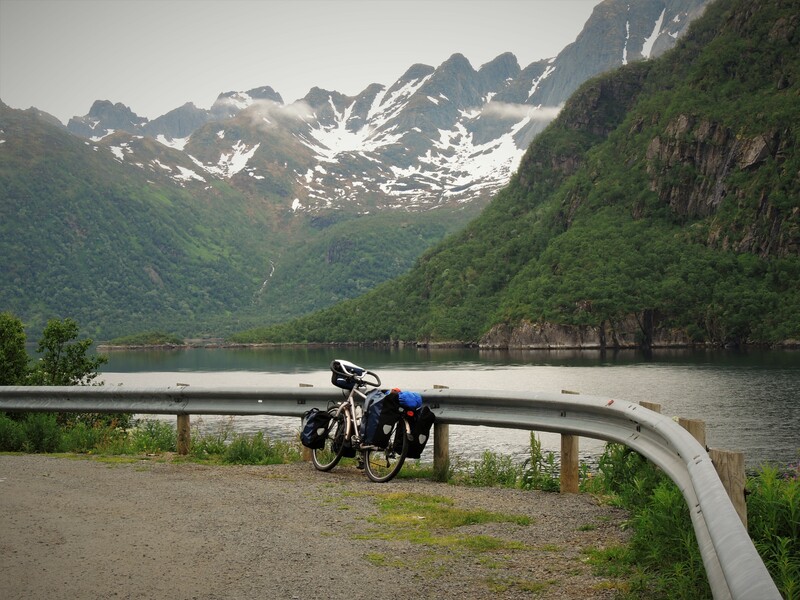 Its a grand spot – it would make a good wild camping spot. Bruno had a paddle, I stuck me feet in and they turned a funny blue colour and started hurting, so I pulled them out again smartish. And so we reached the summit and had a little wander around the edges before stopping by a collection of cairns for an early lunch. The views from Wild Boar Fell today stretched from somewhere North of Gretna to the middle bits of Airedale – and Morecambe bay and much of the Lake District hills. After an egg butty and various other delights, we squelched off to Swarth Fell and Swarth Fell Pike – an easy but sloppy traverse. 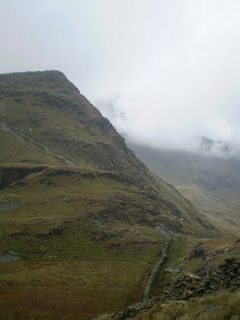 Even sloppier than this, were the moors to the South which lead down to Rawthey Gill Foot – an ideal place to have another lunch….. The River Rawthey is a noisy little stream just here and it could have been due to this that it struck me just how quiet the hills were today. There were times of utter silence – just the tinnitus….. and then the RAF hurtled over and over at Warcop ranges, somebody blew something up…. and a sheep bleated and a slug farted and my left boot squeaked….. But apart from that, it was fairly quiet…. But there are good views, and we splattered across tot he West top – Knoutberry Haw and then, as time was pressing and it was starting to get a little dark – over the big, empty shoulder to drop down to the Rawthey again just a little to the Right of Uldale House. This walk was 15 miles and just over 3000 feet of ascent, and a lot of ruches and sphagnum. Its a good start, though, I think. I’m a bit of a Pennine person – dull, foggy, covered in tussocks…. and I was thinking about a theme for the blog (people may have noticed certain themes or projects at times, such as TGO training and planning and Hadrian’s Wall, for instance). So my new project or theme will be to revisit (for I have visited them all before) all of the 2000 foot tops in the Pennines, starting where I originally started many years ago – with the Yorkshire Dales. There’s another Pennine project I have in mind, too, but I will say no more (not that I’ve said much so far…) till other things come to fruition. Hopefully, people will find whatever it is interesting, though. In the meantime, there’s the Yorkshire Dales 2000 foot tops. The Yorkshire Dales, I’ve decided are the valleys that lie between the A65 in the South and the A66 in the North and I’m starting tommorrow. 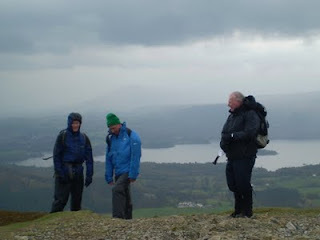 I was thinking of publicising which hills I plan to do and when, so that if anybody wants to join, they can do. Probably a bit short notice for tommorrow, though. Tommorrow, I’ll be doing a very similar walk to one which appeared in October’s TGO – Wild Boar Fell, Swarth Fell (and Pike) and Baugh Fell’s two tops – starting at Rawthey Bridge just up the road from Cautley a little way. I cudder gone to Dent with Mr Banfield and his party and walked to Ingleton in the rain, but , No – Brian had already booked me for this little trundle down yet another North Pennine leadmine. Never go into a leadmine, folks, they is terrible dangerous. But the sand-filled Knipemobile was parked in a puddle somewhere near Garrigill and we debouched to this little mine entrance which may well be Whitesike Mine or , possibly, Bentyfield – I’m not sure which. It was clear from the mucky water emanating from the hole and the open gate at the entrance that somebody was already inside. So we plunged forth down stone-arched passageways and, occasionally parts where there was just rough-hewn natural rock. We crawled through a dig, held up by timber shoring and a bit of pipe and thence forward till the smell of fag smoke and the low rumble of voices could be heard. After a chat , we left and examined the various remarkable iron and flowstone-like formations. The sweet course was a short trip through a long culvert where the water was too deep for wellies and which came out in an ennormous hole with a waterfall and another culvert. We retraced and repaired to Nenthead for coffee. The thing that strikes me about underground trips is that when you eventually emerge, blinking into daylight, no matter how driech it is, there's a warmth and overwhelming scent of pollen or grass or something, and there's the general hum of life and nature doing whatever it is that life and nature and stuff does.. Whatever it is, its a very friendly and warm and welcoming experience. I suppose its just life getting on with being life. Its great. Its fab. Its green and blue and sometimes a bit grey. Its the Pennines. Incidentally, I appear to have gained Brian's wellies and, it seems, he must have mine. Martin (Phreerunner – who’s that fat lad at the back?) Banfield recommended using this Live Writer thingy for the blog as he pointed out that my photos were all in a lump at the top of the blog and it looked crap. So here it is, I’m trying it out. Well, some long time ago, when men were men and women did the washing up, I seem to remember writing that one rainy day I would do some kind of round-up on my findings with regards to the dehydrated food that I used on my Trans-Cumbria-Not-Quite-High-Level-But-At-Least-I-Tried-But-All-The Teasrooms-Were-Closed-And-It-Rained-A-Lot trip. Just to recap, this took place last August during the monsoon period and went from Silecroft to Bowness on Solway via Bow fell and, during which, I ate principally dehydrated food bought on-line from Outdoors Grub Ltd. (although I seem to remember also buying a meal from Cotswolds in Durham – this may well have beeen some kind of dehydrated rice pudding. Sorry to be vague, but I’m getting on in years and the nurses keep stealing my underpants…. First of all, what of Outdoors Grub Ltd? Many would-be TGO Challengers, for instance may well be interested in the standard of service and delivery times and things. And other backpackers, too may be interested. The delivery happened a day or two later and I got two tracking emails telling me where the order was. So, I thought that the service was, in fact, excellent. If I had any gripes, it would only be about the choice of sweet dishes which was a bit limited. This must have been the reason why I bought a rice pudding from Cotswolds, now I come to think about it. I also supplemented my variety of sweet dishes by buying a small cake and scoffing that ravenously with some instant custard. This lasted two meals. In addition, I had my traditional supply of cheap whisky and loads of mars bars, lion bars, jordan’s breakfast and othe r fruity oaty bars of that ilk. These, it turned out were quite a bit heavier than the seven dehydrated dinners. For each meal, I had three (as you were..four) course. Breakfasts were either whatever was on the list above or a couple of Jordans bars or a blow out in Wigton….. Taste – they were all acceptable. 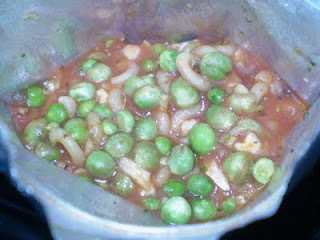 The real Turmat meals were fabulous – just like granny’s cooking but without the cat hairs. The only problem one was the Mountain House Spag Bol which I left too long to rehydrate and it tasted a bit fatty…. But, in general, none of the meals were nasty or cardboardy or anything like that. Mostly they were very tasty and, well, surprisingly nice. Ease of preparation – Just add boiling water, seal the pack and wait for however long it says on the pack. Sometimes you have to search out and remove a gel bag. It wouldn;t do to eat the gel b ag. The meals were generally OK if you put in too much water, and its easy to add more if you don't add enough. Stirring well was very important to avoid any lumps of dried food remaining. Time to prepare – Time to boil water and then to wait from between 2 to 6 or 7 minutes. One pan? No pans were harmed except when I made custard. Need to wash up? – Just the spork! Value for money? – You can see the prices. They not really cheap and the Real turmat meals are, frankly, expensive. But they’re soooo nice. The set of dried food for a week cost me around £60 – which, when you think about it, isn’t really all that expensive. 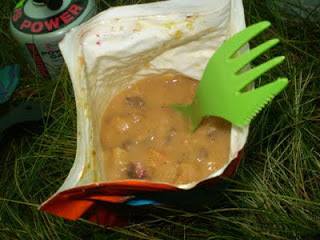 I doubt if anybody would want to survive on dehydrated food alone for a whole week. You’re more likely to be carrying a couple of days, then having a pub dinner or similar. In a case like that, this stuff is convenient, tasty, sufficient and easy on fuel. A massive breakfast in a café in Wigton, or Newtonmore, or Aviemore, or wherever, comes as a real treat afterwards, though and it seems normal to lust after a banana. I must try some of the other meals……. There were ominous omens for this walk. It appeared, at first as though the curse of the ledge route was about to strike again. The MET office, at first, said “Little chance of rain” This soon changed to “light rain and strong winds” and then, a bit later to “heavy rain and gales” MWIS said “rain spitting in the wind and went on to describe, in blowy and scary detail about “ferocious gusts” of wind and an intimation that to venture anywhere near a ridge would be foolish in the extreme. I called in the “Knipes Gambit” move. This is where the walker turns up in a different, less weather-affected place in reasonable travelling distance to the target hill and, if the weather proves fine (because it thinks you’ve gone somewhere else) - you can make a quick dash to the correct place. In the end, by actually looking at the weather chart and ignoring the weather girl’s inane dribblings about it being a “wet old day” tomorrow, I discerned that the wet stuff shouldn’t arrive at Eel crag till well after lunch by which time target number one will be waiting in the bottom of the bag for target number two.. I might be wrong. It could be a gamble. But I called the walk “On”. I could have called it Dave or Norman, but no, it was “On”. No bimbling up Great Mell Fell for us. 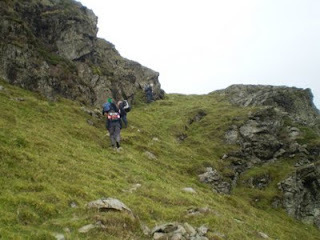 It had to be Eel Crag by The Ledge Route. Oooer. Martin Banfield would be there, and two of R Kidd’s pals – Ian and Brian – so there were others to consider. As it happened, it was a bit windy, furtlingly cold in the wind-chill department, but it only drizzled a bit just after three o’clock and it didn’t really start raining properly till I got to Penrith. There’s a lesson to be learned here. I must try to decide what it is. We lunched out of the wind, monitored by a pair of ravens who were seen to investigate our lunch spot for scraps just after we’d left. As it happens, I’d contributed a few bits of Wensleydale in anticipation. (Cheese, not Hawes and Redmire….) 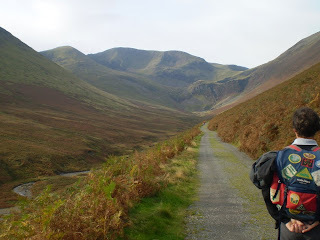 and after paddling around the summit of the subsidiary top called Sail, we trotted off down a little corrie and bagged Outerside and Barrow – two little wainwrighty things which lurk in the undergrowth of the Coledale Round. And so, after a short visit to the Coledale Inn, that was that. Superdawg didn’t attend as he really really hates wet and windy weather. Now he hates the weather girl and will bite her skinny old shins if he ever meets up with her. 8 miles and 3200 feet of uphill. Why do BBC weather peeps use the word “old” all the time anyway? It will be a wet old morning, a foggy old night a windy old afternoon and a dirty old man looking through the window. Finally, our three-day interval next walk took place two days later. 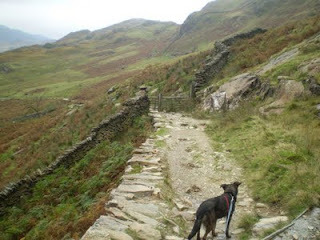 In the end, I was knackered after just the one, and, I thought, so was the dog. So we went for a paddle in the sea instead. 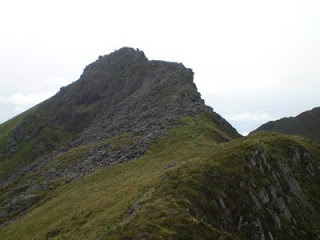 But , turning our attention to Yr Aran for a while, we climbed this by using Snowdon’s Watkin path, turning off and climbing the Southe ridge of Yr Aran and retuning via Bwlch Cwm Llan. It was foggy and drizzly and the rocks were slippery. I managed a few pirouettes and a graceful slide or two and resorted to gluteae for friction. I had the hill to myself, although I was aware that a couple from Rhayader were bagging the hill at the same time. But I didn’t see them. 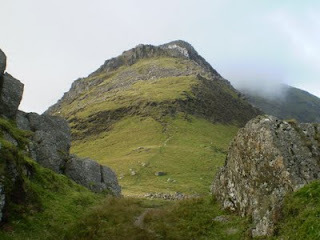 What I did see, however,, was a location from “Carry on Up the Khyber” (She is enamoured of the khasi). I believe this is the location of the khasi pass – defended by the devils in skirts themselves. (The plot , of course, is based on the fact that the entire regiment is secretly wearing underpants under their kilts, although why a lack of trollies should scare the local taliban in a bit of a mystery. 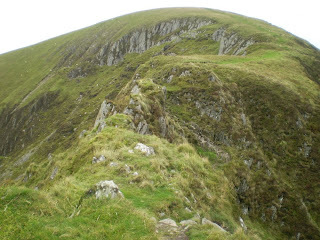 Bernard Breslaw’s performance of Bungdit In was a comedic classic and almost as enjoyable as Cnicht’s south ridge and the dinner during the siege was almost equivalent to the Nantlle ridge’s spiky bits. I thought it was good anyway….6 Miles and just 2300 feet of upness. Walk four of my walk-every-third-day-in-Wales plan commenced just three days after the Blaenau hills walk on 13 October. 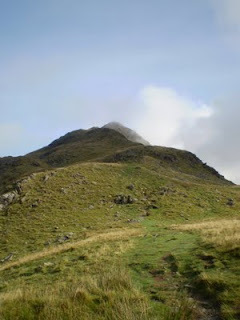 Today’s menu would start with the pyramidical Hewitt called Cnicht and be followed by the Hewitt/Marilyn Moelwyn Mawr and it’s satellite Moelwyn Bach. 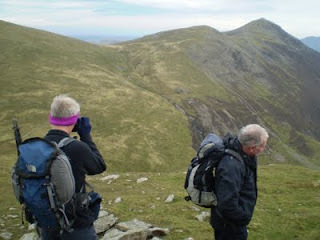 This is, I have to report, another great classic Welsh hillwalk. If you go to Wales, you really ought to have a bash at this one. We start at the hamlet of Creosor, an ex-quarrying village in Cwm Creosor, once concerned with the produiction of billard tables, apparently. Anyway, whatever, there’s a free car park and a café there now. Arrows point the way to “Cnicht” and me and superdawg and two or three other parties were soon engrossed in the sheer pleasure of climbing up Cnicht’s south ridge. This a narrow, rocky, spiky sort of affair, but never anywhere difficult or scary and almost gets to scrambling at one or two points, but doesn’t quite make it. If you climb this and you are scrambling, you’ve gone the wrong way. 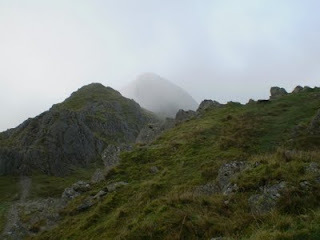 The summit is an airy perch high above Cwm Creosor and the ridge continues Northwards in a bumpy kind of fashion. Two Nuttal-baggers (poor, demented souls) were busy bagging Cnicht North Top and I came across these two lads at various stages later in the day. After the delights of Cnicht, we traversed a complex area of knolls and tarns, made a bit more complex by the fact that the path on the ground seems to be a bit South of the path on the map. 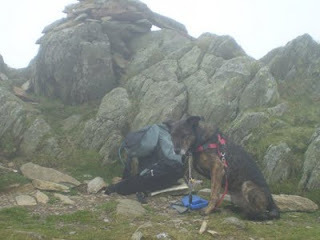 Ultimately we get to start climbing the North ridge of Meolwyn Mawr, where we all bag the diminutive Nuttal, Moelwyn Mawr North Ridge Top (I think) A nice enough place, but it needs a better name…..
Me and Bruno continued to the top of Moelwyn mawr whilst the two Nuttal baggers baggerred off somewhere else. 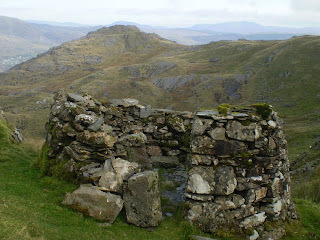 Moelwyn Mawr is another splendid high perch from which to survey a domain, if you have a domain to survey. Otherwise its quite a good place to eat chocolate. 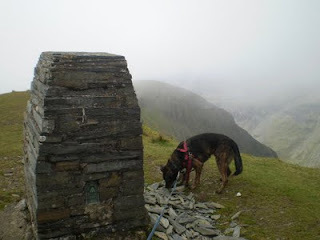 Craigysyfarn was next – a smallish but veryu rocky bump a bit South and with a very steep descent to Bwlch Stwlan where there are ancient quarry traks and a circular shelter for the drinking of the last dregs of tepid coffee and a short snooze. The path avoids a direct approach to Moelwyn Bach’s crags by a little easterly and obvious path and soon pops out on to the wide summit. 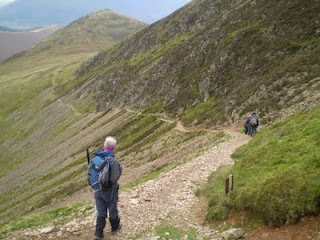 We romped down the long Western ridge and then by road back to the start. Fab walk in bright and at the same time, misty weather. 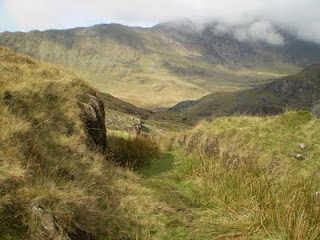 Walk Three of my Welsh Wanderings in the Wain. 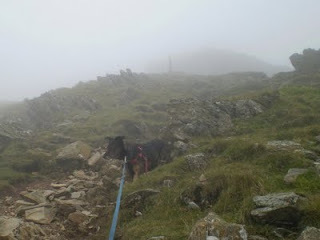 Ashley, it wasn;t raining, but it was very foggy on the hills, from about, say, 300 metres and upwards. I like to call this fog on the hills, “hill-fog”. There was hill fog and I decided that today, I might need a compass. Unfortunately, I ‘d left the damn thing, along with my other compasses (I have a collection) in Crook, some 250 miles away from base. Attempts to buy one in Blaenau Ffestiniog failed. So I determined to use my GPS instead. This worked well. 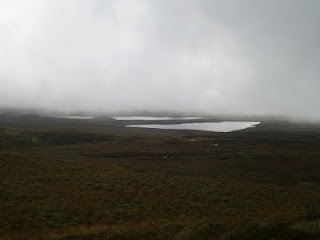 I left a misty and driech Blaenau to it’s cwmpass-less ness and plodded up through grey quarries on to a greenish-grey desert of damp brown grass and along tracks to a high tarn or lochan, or , maybe a little Llyn (Llyn bach?) one of two Llynau Barlwyd just below the beetling slopes of Moel Farlwyd, which superdawg pulled me up dogfully. We tarried not on the summit, but evacuated to the rocky bwlch or bealach just a bit East, and then, after destroying a banana by consumption, we toiled up the slopes of Moel Penamnen, our first Hewitt of the day, where we saw nothing but mist and a couple, the female of which said that Bruno reminded her of her departed pooch, the three-legged huntin’-hound Zero. 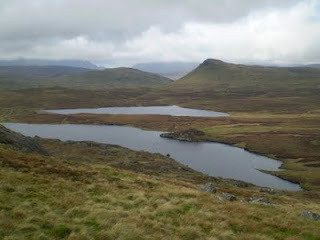 We tarried not yet again, but hurtled off on a kind of bearing over blank moors to Foel-Fras, where a bit of a view appeared for a while – some lochans under the mist – Llyn Newydd and Llyn Bowydd – reservoirs for the quarries. We lunched on an island of rock in the heather and bog. 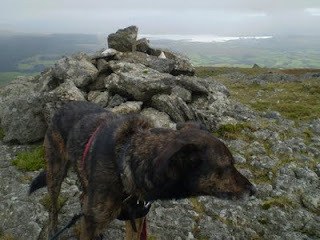 Afterwards, we slithered up to Manod Mawr North Top, followed by Zero’s ex-mistress and her partner where the clouds parted and a big view appeared. The descent from this top to get to Manod Mawr is barred by a great big hole or quarry and any attempt at a direct traverse would end in ripped trousers and lost fingernails at best. Quarry tracks are the key, and these eventually lead the walker and his loyal pooch through the piles of slate to the moor leading up to Manod Mawr itself. Our third Hewitt and the today’s Marilyn. 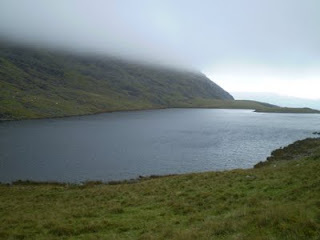 Here, the mist closed in again and so it was blindly that we trotted down the hill to Llyn y Manod and a climb up Manod Bach in failing light. So that was little manod and Big Manod both bagged. Quarry tracks and an ancient incline took us easily down top Bethania for a short road-walk lead back to Blaenau, where a drunk at a bus-stop seemed to say something about monkeys to me…..? 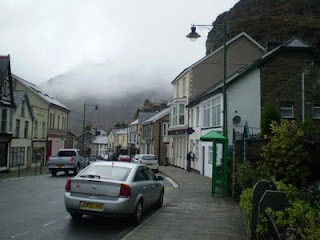 Its always foggy at Blaenau, it seems to me, and for a town in the midst of such baggable hills, it seems odd that there isn’t a place to buy a cwmpass or even a pair of socks. But the place is friendly enough, and, with its surrounding crags and quarries, its probably one of the most distinctive towns in Britain. You always know where you are when you’re in Blaenau. 10 miles and 3400 feet done today. I drove a long way up Cwm Pennant, paying the one pound parking charge at the farm where the farmer was doing something highly unpleasant to a calf, to the road end where a camper van was parked. The chap from the van said “hello” and introduced his wife’s black lab guide dog and explained the intricacies of the local paths, which are, as he said, a bit intricate at first. But we soon found our way through intitial tussock and gorse defences through old slate quarries to the bridleway to Rhydd-Ddu and thus up through Cwm Marchnad to the summit of Y Garn, the first top on the ridge. It was fairly obvious from here that the rest of the ridge could prove interesting, the next top appearing to be a leaning spike of the sort you might find in a more ginger-haired highland region a bit further North. And so, we nervously scrambled up Mynydd Drws-y-coed and sat on a ledge near the top. 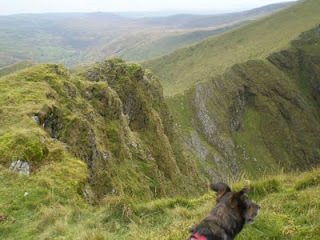 A couple scrambled up after me and asked how far the Nantle Ridge went. 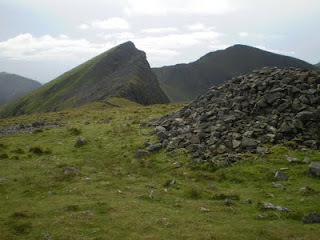 So, this was the Nantle Ridge eh? I’d heard of that somewhere…..
A section of narrow ridge connects Mynydd with Trum y Ddysgl, which has a stupendous view over the intervening corrie (sorry – Cwm….) and yet another narrow ridge connects this one with Mynydd Tal-y-mignedd. All good, clean fun so far. This last Mynydd has a dry stone pillar on the top, so I lunched in its shelter from a nithering wind. The couple I’d met earlier pressed on. A steep drop off this Mynydd leads to Bwlch Dros-hern from which the path skirts crags on the North side of Craig Cwm Silyn before tracking up through bloulders to the top. From here the ridge is wide and grassy and/or bouldery to the final cairn on Garnedd Goch. 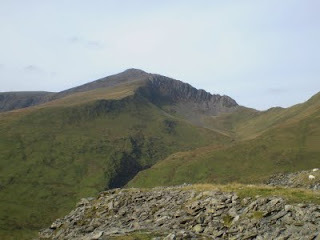 I descended by skirting the top of Craig-las and big scree fields to the top of a wide ridge which took me back down to Cwm Pennant. Worra cracking walk. 9 Miles and 3600 feet of climbing. – and a bit scrambly, but nothing too serious, although one or two places were a bit awkward for the dog. A white cud-chewing cow blocked the narrow road on the way home and wouldn’t get out of the way despite polite requests, blasphemy, verbal abuse and being driven at. It did seem vaguely interested in my headlights. Eventually, she ambled off, unconcerned.